Current issues in management and conservation of natural resources. On April 19th a conference was held at the faculty of biology, University of Seville. 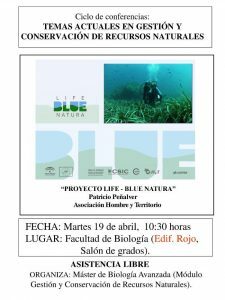 This meeting aimed to raise awareness on the actions and initiatives carried out by the Life Blue Natura project. Patricio Peñalver talked as a spokesperson for Asociación Hombre y Territorio, one of the many NGOs that collaborate with this European program. The conference was attended mainly by students from the US, who were taught about different types of carbon, with special emphasis on the concept of “blue carbon” and “carbon markets”. In addition, Patricio explained the different branches of Life Blue Natura: technical study, research, carbon markets and social participation. It is fair to say that the students attending the conference showed considerable knowledge on the different types of seagrass beds and their benefits as vital assets in the fight against climate change. In the final part of the meeting, they were given data on how much carbon ecosystems such as mangroves, seagrass beds and tidal marshes can accumulate, and some information on the degradation that these habitats of vital importance (for conservation purposes) are facing.